DOT at their zenith--headlining the Ace of Spades and packing in the crowds. 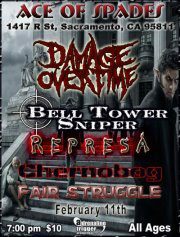 Final show for Bell Tower Sniper--longtime Sacramento favorites. Another local legend from Sacramento. Damage Over Time headlining the Ace of Spades with Bell Tower Sniper, Chernobog, and Represa.